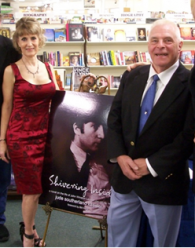 PHILADELPHIA - Jan. 8, 2014 - PRLog -- Beatles expert and author Jude Southerland Kessler is excited to announce the Richard Langham of London, England will be joining her on her promotional tour in February 2014 for the 3rd book in her John Lennon Series – She Loves You. Langham worked closely with Kessler, consulting with her on the Beatles recording sessions at EMI where he worked as 2nd Engineer from 1963 to 1970. "Richard spent months helping me edit the recording session chapters for both Shivering Inside and She Loves You. Since he was actually present for the making of With the Beatles, his input on those chapters was invaluable. It was such a boon to have an informed, educated primary source directing my account of those studio experiences," says Jude Kessler of her time working with Langham. Richard Langham worked as the Second Engineer at EMI (Parlophone Studios) at Abbey Road during the Beatles recording of: Please Please Me LP in February 1963; From Me to You on 5 March 1963; and With the Beatles LP in mid-1963. Mr. Langham also had the privilege of working with Cliff Richard, The Shadows, Rosemary Squires, Paul McCartney, Judy Garland, Marlene Dietrich, Noel Coward, Shirley Bassey, Ella Fitzgerald, Sir Malcolm Sargent, Riccardo Muti, and many others during his time at EMI. For interview requests, email: jennifer@moonglowpr.com.